This may sound a silly question, but what was Silly Putty originally called? As with most beginnings, they often happen by accident. 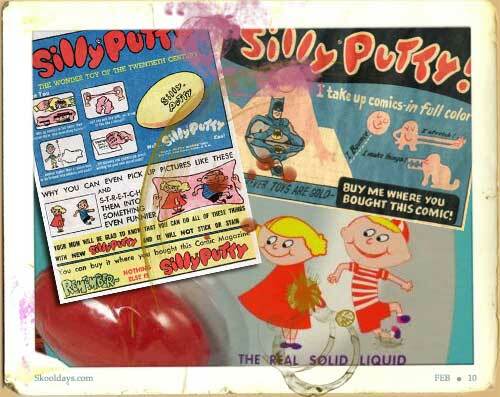 Silly Putty is marketed today as a toy for children, but was originally created by accident during research into potential rubber substitutes for use by the United States in World War II. Credit for the invention of Silly Putty has been attributed to Earl Warrick. He discovered that reacting boric acid with silicone oil would produce a gooey, bouncy material with several unique properties. The non-toxic putty would bounce when dropped, could stretch farther than regular rubber, would not collect mould, and had a very high melting temperature. By 1945 it was ready for the toy market. quantity by physical therapists for rehabilitative therapy of hand injuries. Silly Putty as a material is also used therapeutically for stress reduction.